Pizza Contest Theme Fun Kids Cup A Fun and exciting new kids cup featuring the pizza chef chasing his ingredients down the hill for the Pizza Contest. The cup is designed with children in mind and contoured to reduce spills with tight fitting lids to prevent leaks. As always, products from Airlite Plastics are Safe Quality Food certified, BPA free, reusable, dishwasher safe and recyclable. Perfect for Pizza Shops, Italian Restaurants, parties and concession stands. Case includes 250 cups, lids and straws. Another New Fun and Cute Kids Drink Cup...Ocean Friends Fun Kids Cup. Ready for a fun underwater adventure? Join us at the bottom of the sea with this newest Ocean Friends fun kids cup. The cup is designed with children in mind and contoured to reduce spills with tight fitting lids to prevent leaks. As always, these kids cups are Safe Quality Food certified, BPA fee, reusable, dishwasher safe and recyclable. Perfect for Seafood Restaurants, Coastal and Resort locations, zoos and parties of all shapes and sizes. Case includes 250 cups, lids and straws. We now have fun drink cups especially made for Children. You and your family have been invited to a party with our Forest Friends. Hang out with this heartwarming beaver and the bunny as you enjoy good times and good food. 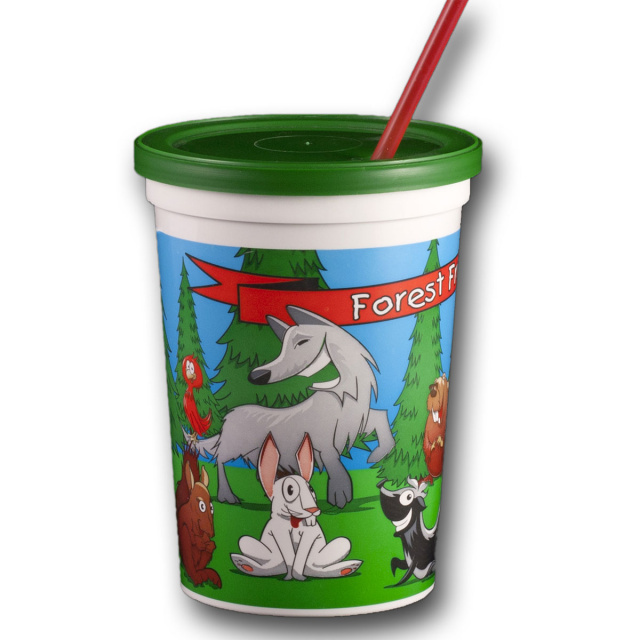 This Adorable Forest Friends Fun Kids Cup is designed with children in mind and contoured to reduce spills with tight fitting lids to prevent leaks. These cups are BPA Free, reusable, dishwasher safe, and recyclable. Perfect for all types of restaurants, zoos, parties, and concession stands. Case includes 250 cups, lids, and straws. 12 oz Kids Cup with Red Lid and Kurly Straw. This happy kids cup features children playing a variety of sports and activities. Great for any party, event, or gathering involving children due to the colorful design, tight lid, and Kurly Straw. And will be a great addition for use at restaurants while serving kid's meals. Packed 250 cups per case. Forest Kids Sippy Cups. Now get your favorite nature theme cups in "sippy" style. The cup is designed with children in mind and contoured to reduce spills with tight fitting lids to prevent leaks. As always, products from Airlite Plastics are Safe Quality Food certified, BPA free, reusable, dishwasher safe and recyclable. These cups are 12 oz cups and are packed 250 case. Cups and lids are packed together. Ocean Friends Kids Sippy Cups. Now get your favorite nature theme cups in "sippy" style. The cup is designed with children in mind and contoured to reduce spills with tight fitting lids to prevent leaks. As always, products from Airlite Plastics are Safe Quality Food certified, BPA free, reusable, dishwasher safe and recyclable. These cups are 12 oz cups and are packed 250 case. Cups and lids are packed together. Also check out from our tropical drink cups selection...our new 12 oz Twister Emoji Topper Drink Cups and our new 12 oz Twister Kiddie Topper Drink Cups.